Today, we will drive to Ouarzazate through the Tizi Ntichka mountain pass (2260m), over the High Atlas mountains, and we will appreciate the beauty of the landscape on the twisted road through the Berber villages. We'll get to Ait Benhaddou village, to visit the famous Kasbah. The Kasbah is a UNESCO historical site. After lunch in the Ait Ben Haddou Kasbah our private Morocco tour continues to Ouarzazate, called “Africa Hollywood”, where we have the opportunity to visit local studio,where many famous movies were shot : Gladiator, Kondon and Alexander the Great, The Mumie, Asterix. 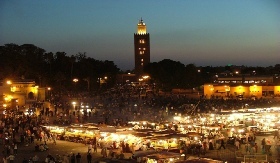 Then we visit Taourirt Kasbah and we spend this night in a hotel in Ouarzazatte. We continue our private Morocco tour departing from Ouarzazate to Zagora desert through the Draa valley, where we will visit Kasbahs and the palm of the oasis. After lunch in Zagora we’ll visit Tamegrout village and its Islamic-book shop, the oldest in the area, which served as a school and the source of Islamic education in the region. Our visit continues to the pottery traditional factory works where you will see men making different pots and kitchen dishes. 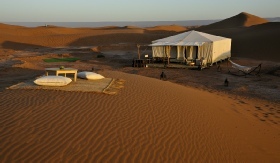 Then we will return to the hotel in order to go to the Ennakhla dunes by camels to spend night in Berber tent in the bivouac to enjoy desert sunset on the dunes. On the last day of our private Morocco tour ,after we return from the desert dunes, we will drive towards Tizi N tichka mountain pass and then we continue to Marrakech where our tour finish.